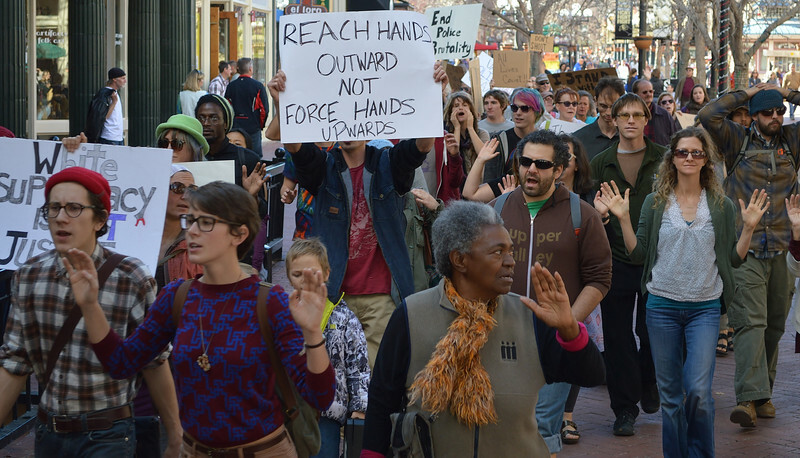 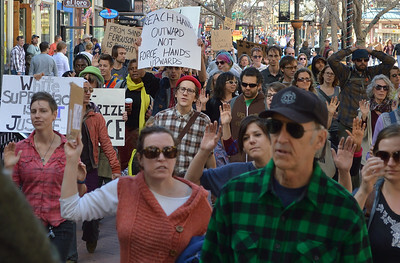 Demonstrators rallied and marched through downtown Boulde, Co to protest the Ferguson garnd jury decision. 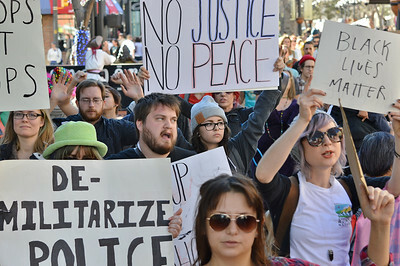 Includes images of marchers with signs and banners as well as protesters committing civil disobedience by lying down in city streets. 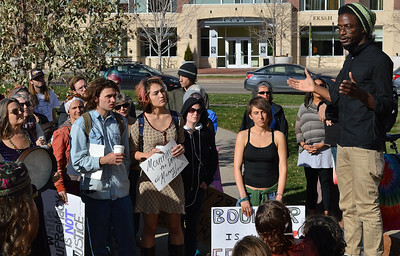 Young African American man gestures while speaking at rally, spectatators listening, some holding signs. 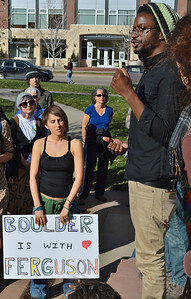 Young African American man speaking at rally, spectatators listening, one holding "Boulder Is Ferguson" sign. 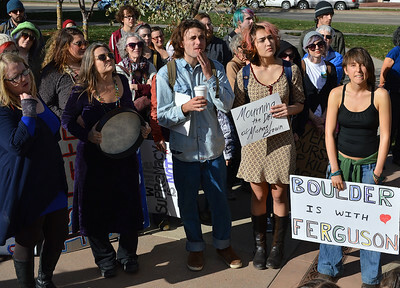 Group of protesters listening to a speaker, one holding "Boulder Is Ferguson" sign. 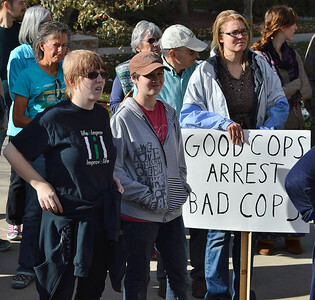 Group of demonstrators at Ferguson protest, one with sign "Good Cops Arrest Bad Cops". 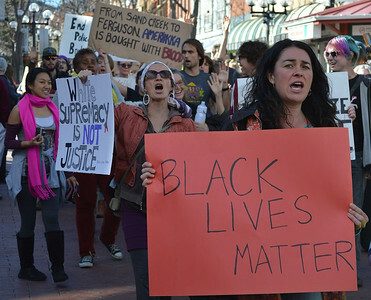 Woman shouts while marching, holding sign "Black Lives Matter", other protesters behind her shouting and carrying signs. 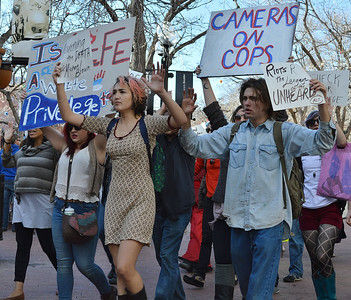 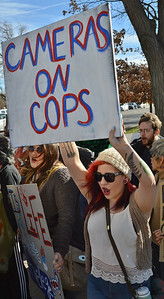 Young woman protester marching with sign above her head, "Cameras On Cops". 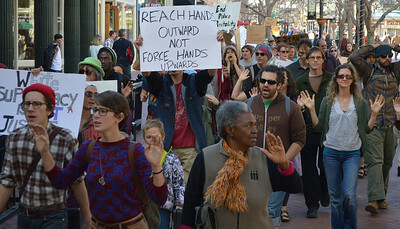 Group of demonstrators marching in protest ove Ferguson grand jury decision, many holding signs above their heads. 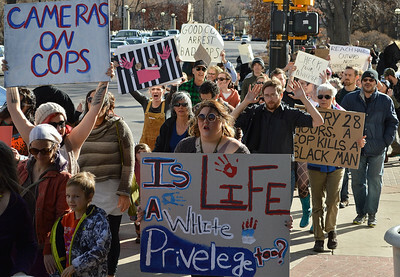 Young woman marching in protest about Ferguson grand jury decision, carrying sign about "white privelege", other demonstrators with signs behind her. 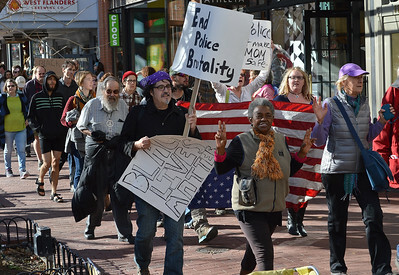 African American woman raises hands in peace sign, marchers behind her carry American flag. 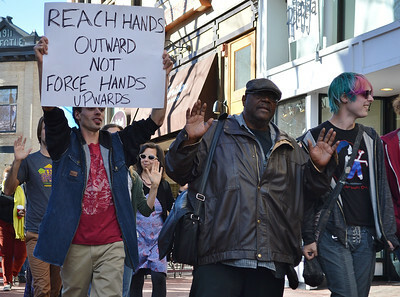 African American man raises hand while marching in protest about Ferguson, other demonstrator next to him raises sign above head. 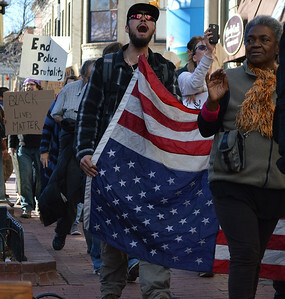 Man carrying upside down American flag, shouts while marching in Ferguson protest, next to him African American with hands raised. 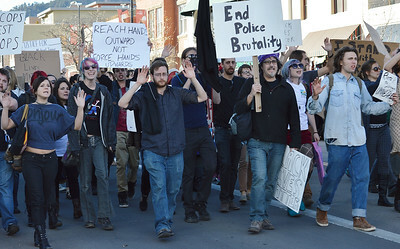 Group of marchers at Ferguson protest, some carrying signs, other with hands raised in the air. 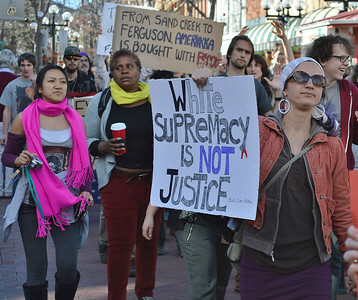 Woman marching with sign about white supremacy, other protesters behind her. 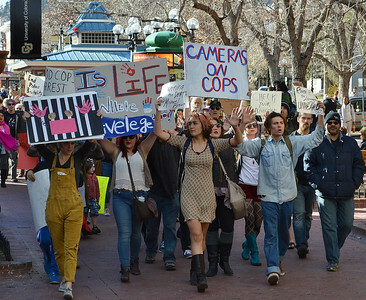 Large group of protesters marching, some carry signs, some with hands raised in the air. 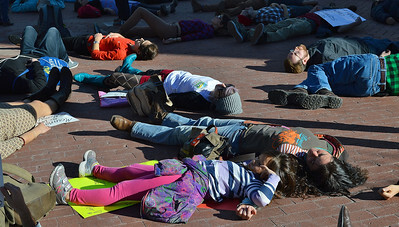 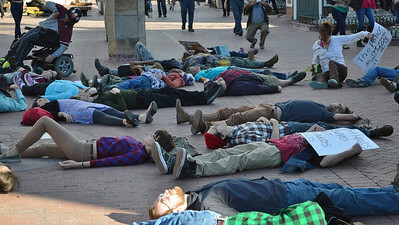 Demonstrators lying down on street to protest Ferguson grand jury decision. 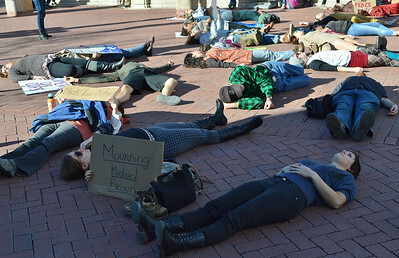 Demonstrators lying down on street to protest Ferguson grand jury decision, including mother and young child. 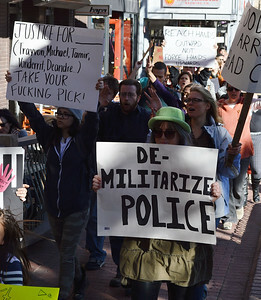 Woman marching with sign about "militarized police", other protesters with signs behind her. 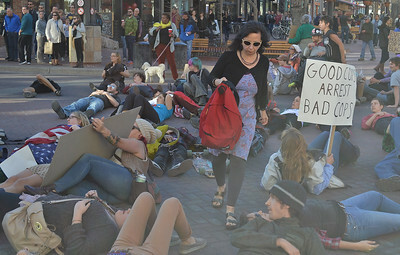 Woman carrying backpack walks between large group of protesters lying on city street. 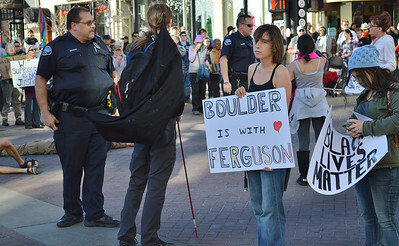 Two police officers watch protesters standing in street crosswalk, including one young woamn with sign "Boulder Is With Ferguson". 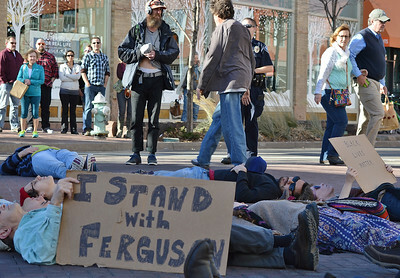 Protesters lying in street, one with "I Stand With Ferguson" sign, pedestrians walking by and standing and watching. 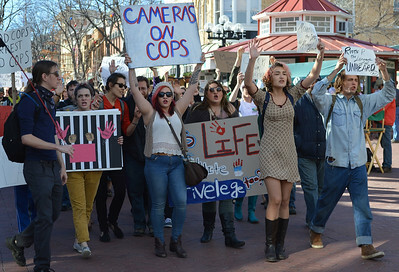 Large group of protesters marching with signs, some raising their hands in the air. 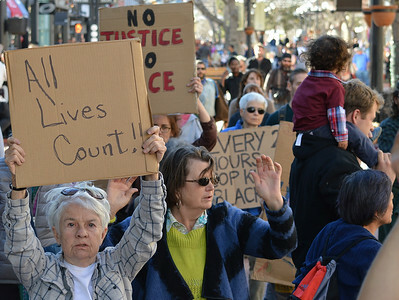 Senior woman raises signs above head "All Lives Count", other protesters behind her with signs. 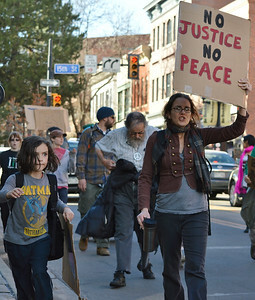 Woman marching while holding sign above her head "No Peace, No Justice", young son marching beside her, man with peace sign around neck behind them. 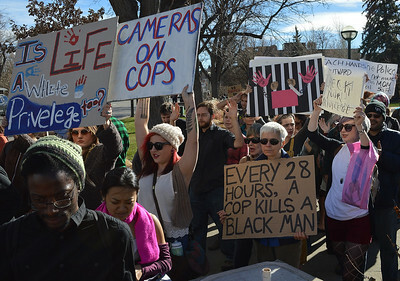 Large group of protesters with signs including one that says "End Police Brutality", some marchers raise hands in the air. 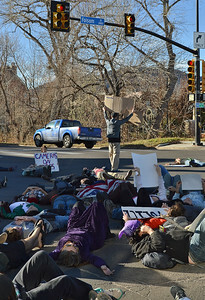 Large group of protesters lying down in intersection, one man standing, holding sign above head.